After introducing the story and exploring a bit, Jay finds a dark cave and begins his search for the lantern to light the way. Finally! It’s time for another Let’s Play series. 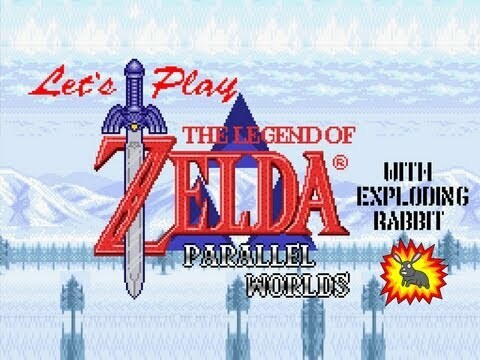 The game I’ve chosen is called The Legend of Zelda: Parallel Worlds, and it’s a hack of The Legend of Zelda: A Link to the Past created by Euclid and SePH. I really should have done this sooner, but I thought it was more important to work on the game than to make videos. Also, I didn’t realize how much people enjoyed my LP’s of The Tale of Elementia and Super Mario Bros. Crossover. And I stupidly didn’t realize how lucky I am to be in a position to make money off of videos like this. I have realized my stupidity and I will be doing more videos from now on. In this first episode, I go through the story and introduction to the game. After talking to some guards and exploring a bit, I find a dark cave and begin my search for a lantern. For some reason I forget that I can just look at the map to find out where I’m supposed to go. I guess trying to be funny while playing makes me a bit less intelligent.